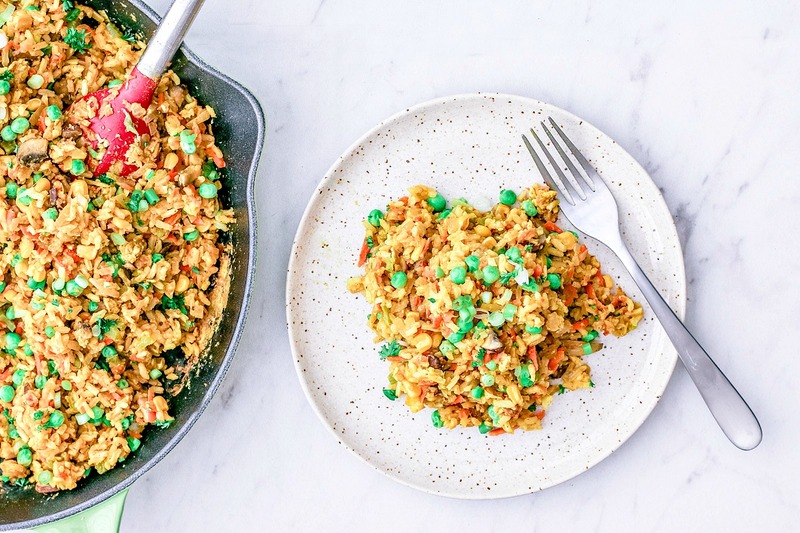 No matter how many new and (what I think are) exciting recipes I publish here, this Easy Curry Fried Rice continues to be one of my most visited. It stares me in the face every time I check my top posts. I guess you really can’t go wrong with a simple 30-minute meal. This recipe is also a great way to use up any leftover veggies hanging out in your crisper, and any leftover rice. In fact, I encourage leftover rice! It’s one of the key factors to bringing your rice to that nutty and crispy perfection we love so much with restaurant fried rice. It feels a little odd to dub this a 30-minute meal when I’m about to tell you to start prepping the night before, but it’s more of a suggestion than an instruction. Just roll with it. Freshly-cooked rice is full of water and moisture, which makes it difficult to get that crave-worthy chewy crisp we expect in fried rice. But leftover rice kept in the fridge overnight dries up and hardens, making it the *perfect* texture for fabulously fried rice. Crispy bits, please and thank you. While frying rice in our pans, we’re inclined to stir. We hover over the stovetop, we take in the pleasant aromatics, and we stir — usually out of sheer boredom. For crispy fried rice, we need to chill the eff out with the damn stirring. Once your aromatics, proteins, and veggies have been cooked over high heat, press the rice down, flattening it with your spatula. Set a timer for 2-3 minutes, and walk away. WALK AWAY. Otherwise you’ll scratch the itch and stir, ruining the entire thing. Once your time is up, give the rice a toss. You’ll see that the rice that was pressed against the bottom of the pan is toasty and crispy. Repeat this process 3-5 times if you want. I like a lot of crispy bits, so for me, it’s worth the wait. For more easy weeknight rice recipes, check out my Instant Pot Honey Garlic Chicken With Rice and Cashews and my hearty Instant Pot Spanish Rice With Tomato Sardines. This Easy Curry Fried Rice uses day-old rice to get a crispy, nutty texture, and a toasty flavor. Toss it with veggies and a scrambled egg for fried rice perfection. Heat oil in a large skillet or wok over moderate heat. Add the garlic and onions, and simmer until fragrant, approx. 3-5 minutes. Stir occasionally to keep garlic from browning. Add the celery, carrots, and mushrooms. Simmer for approx. 5 minutes or until veggies are tender. Add the curry powder, plus a pinch of kosher salt and ground black pepper. Stir to combine evenly throughout the vegetables. Sweep the vegetables to the side of the pan; add a bit more oil if needed. Add the beaten eggs to the center of the pan and allow to cook briefly, dragging your spatula through the cooking egg to create ribbon-like chunks off egg — same way you'd treat an egg when making them scrambled. Once cooked, stir in the vegetables and break up the egg to distribute it throughout the vegetables. Add the rice to the skillet in batches, stirring to coat. Add the tamari or soy sauce and mix well. Finally, add the scallions, frozen peas, and frozen corn (the frozen peas and corn will thaw very quickly once they're tossed in with the hot food). Bring the heat to medium-low and press the rice down into the pan, flattening it with your spatula. Let the rice sit like this, undisturbed, for 2-3 minutes. After that time is up, give it a stir, scraping crispy toasted bits from the bottom of the pan. Repeat this process 3-5 times, until you get the amount of crispiness in your rice you desire. Season with salt and pepper, to taste, if needed. Remove skillet from heat, garnish with freshly chopped parsley (optional), and serve. *Day-old rice is suggested for perfectly crispy fried rice. Freshly cooked rice is full of water and too moist. If you must make a batch of freshly cooked rice, please note that you may not be able to attain the crispiness desired and the attempted crisping process by pressing the rice into the pan for several minutes may result in a longer cooking time. Looks great! Curious as to what type of rice you recommend... I currently have basmati and long grain in the pantry! Thanks Patty! Either of those would work, but hot damn basmati would be perfection :) I hope you love it! Let me know! This looks excellent! What brand of curry powder do you use? Hi Jeff! Thank you! I've actually eaten this dish with so many different brands of curry powders, always whatever I had on hand at the time—from Simply Organic to McCormick to Penzey's. The flavor has always been super similar. If you're looking for something high quality, I'd definitely hit up a local Indian market if there's one nearby. The closest one to me is quite a hike, so I haven't gotten out here yet, but one day! I'll be interested to see the difference. Definitely let me know if you try it out, and with what brand! It's no wonder this deliciousness is so popular! This looks so good and I can think of so many things I'd serve it with. Yum! This fried rice looks absolutely delicious and such a great idea for dinner. Will definitely try this recipe soon! I haven't had much luck making fried rice at home so I love these tips! Trying this ASAP. The crispy bits are the BEST part. Wow your fried rice looks so colorful and perfect. I am a lover of curry and rice so this is one of those that I need to try really soon. All your pictures are also lovely! This is absolute comfortfood for me. I can eat it anyday 24/7 :) Love the combination of veggies you've added and it's making me super hungry now ! Thanks Molly! These veggies really work well, but you can definitely add whatever else you'd like. It's pretty versatile! This looks delish and the photos are stunning!